Good 'ole Foozie B. Its been established that he is neurotic about licking. That's why he wears a shirt all the time. He will lick his armpits until they are completely devoid of fur. Well, recently he got a boo boo on his toe and he decided to lick it so it would be an even bigger boo boo. So naturally we cleaned it up and wrapped it so it would get better. Foozie decided that he would lick his foot above the bandage so now he has two boo boo's. 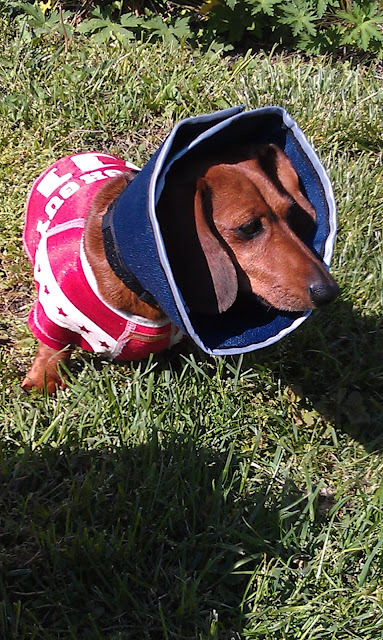 Enter the Cone of Shame. Couldn't just leave it alone could ya? I feel bad, because he's obviously not happy, but in a way one can't help but laugh because he looks funny. Then you feel bad again, because your finding humor in his discomfort. We are hoping we can get him to heal up enough so he doesn't have to wear the Cone of Shame for the rest of his life.